Homecoming 2017 begins tonight! Our football team will take on High Plains at 7 p.m.
Conference Cross Country has been moved to Calamus Golf Club near Burwell. It will begin at 2 p.m. today. The Senior Tailgate Fundraiser has been moved to the cafeteria. It will still begin at 5:30 p.m. The Senior Recognition following the game has been moved to the gym. All alumni who sang the national anthem while at NC are invited to join this year’s Master’s Musicians in singing “The Star-Spangled Banner” just prior to the football game. Meet at the 40-yard line to join in. There’s also still time to register for the Renewed Strength 5K! Register here or at the football game tonight. Check-in is at 7:30 tomorrow morning, and the race begins at 8. 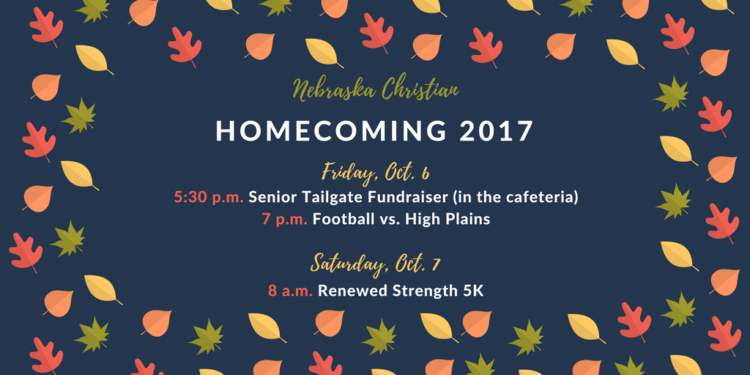 We hope you’re able to join us for some or all of our Homecoming 2017 festivities!